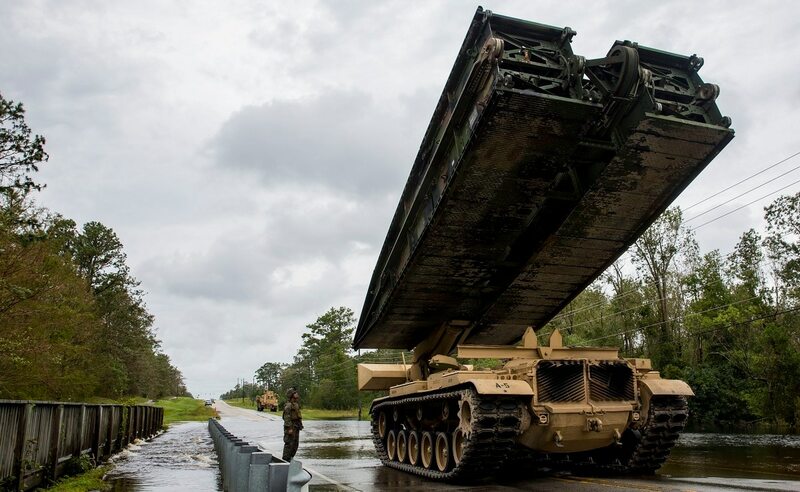 Two amphibious assault vehicles and two hardback Humvees were deployed from II Marine Expeditionary Force at Camp Lejeune, North Carolina, to aide in the rescue of approximately 20 local residents, according to the Marine Corps. The rescue took place Saturday, roughly three miles off the Marine base. The civilians rescued were in danger due to rising waters because of continuing effects from Tropical Storm Florence. Onslow County’s Emergency Operations Center took full advantage of the branch that has specialized in amphibious operations since 1775. According to a Marine Corps press release, the call from Onslow County went directly to Camp Lejeune’s Security and Emergency Operations Center for a request for support. After completion of the rescue, the civilians were transported to the Piney Green Volunteer Fire Department. Rescue assistance by base commanders was recently authorized by Secretary of Defense James Mattis during a media briefing on storm preparations. Commandant of the Marine Corps Gen. Robert B. Neller took to Twitter to remind the local community that the Marines are assisting in evacuations, as well as to inform those Marines that chose to evacuate the area to not return to base until Sept. 24. According to the Marines, the county is requesting additional support from the base. The Marine Corps has reported that they will be moving to support these requests for aid.